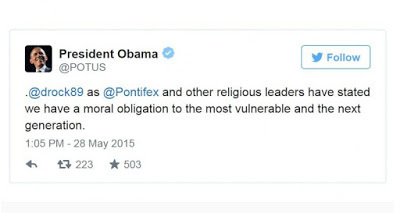 The president tweeted the pope. You can see the message above. I find his words nothing short of obscene. It takes a brazen man to talk about a moral obligation to the most vulnerable when he stands squarely opposed to any sort of regulation when it comes to human abortion. The most vulnerable, our next generation, have zero legal protections during their 9 month residence in the womb. President Obama has not only blocked efforts to protect these innocents, he has forced taxpayers to pay for human abortion through backdoor means hidden in Obamacare. The president wouldn’t know a moral obligation if it bit him. Simply nauseating! !… I saw a story today that the artist who created the infamous “HOPE” poster for the ’08 Obama campaign says that Barry has “let him down”, but that he still believes that the President is a “quality human being”…. With “quality” like that, who needs words like “vile”, “loathsome”, or “evil”… Did I miss any? Yes … cynical. Thanks for writing.